November | 2008 | Shelf Elf: read, write, rave. Can you get over the cuteness of sweet little Tupelo, riding the rails with her sock toy, Mr. Bones? I thought not. 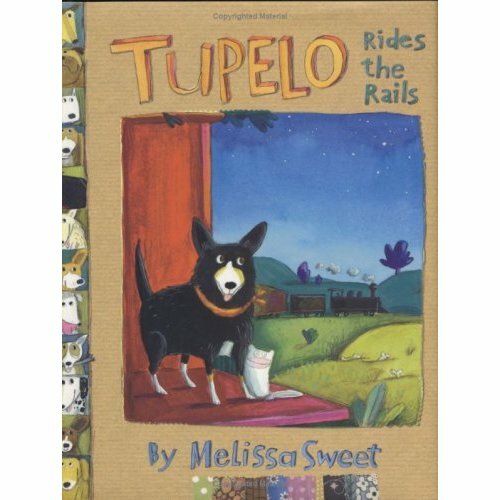 In her newest book, Tupelo Rides the Rails, Melissa Sweet has created a charming, heart-wearming tale of doggy adventure, determination and dreams. Move over Lassie and Toto, there’s a new pooch in town. After the wonderful dog-inspired timeline at the beginning of the book, page one of this tale finds Tupelo abadoned on the side of the road by her owner, with only her sock toy, Mr. Bones, for company. Quel cruel world! Luckily Tupelo is both resourceul and optimistic and she tells her trusty sidekick, “Everyone belongs somewhere. We’ll find a place.” So off they go, searching for their tribe. They soon find a group of hounds preparing for an ancient bone-burying ritual. The BONEHEADS (Benevolent Order of Nature’s Exalted Hounds Earnest and Doggedly Sublime) plan to bury their bones as offerings as they make wishes to Sirius, the Dog Star. All of the dogs want something a little bit different, but mostly, they’re each longing for their perfect home. I won’t reveal more, because it’s far more delightful just to read it for yourself. But I will tell you there are wieners and a train ride and a whole lot of happy endings involved. I am crazy about the illustrations. As in one of my other fav Melissa Sweet titles, Carmine, the illustrations here match the free-spirited, whimsical and warm overtones of the text. I can hardly choose a favourite, but it I had to, I’d pick the full-pager of Tupelo sitting all alone at the top of a grassy slope, eyes turned skyward towards the Dog Star, making a wish with all her might with Mr. Bones in her mouth. Adorable. Pure sweetness. Bravo Melissa Sweet. Give this book to any dog lover, to any kid, to anyone. Visit Melissa Sweet’s website as well as the Houghton Mifflin Reader Guide for some great suggestions for educators. Oh, and you MUST visit Tupelo’s own site too, My Dog is a Bonehead, where you can send a picture of your pup and he can join the rest of the Boneheads and support Animal Shelters too. This entry was posted in Illustration, Picture Books on November 28, 2008 by shelfelf. For the past 3 years, I’ve had the Portfolio Edition of The Mysteries of Harris Burdick lying unopened on a shelf in my basement, getting dusty. In fact, I’d forgotten about it completely until I was rooting around for something last Saturday and chanced upon it. So this week, I decided to pull it out and I brought it to school and I don’t think I’ve ever seen so much excitement and eagerness to write in a room full of children. Ever. I think it’s magic. Honest to goodness teaching magic. Every Grade 5 teacher needs this book, and needs the portfolio of illustrations to use as well, because it will get students writing in a way you wouldn’t have thought could happen. In only two days, I’ve got practically a whole story from every single kid in my class. The students who find it painful to write two sentences when you ask for five have created pages of story, without any planning or guidance or struggle. They’re just desperate to get the stories out and to read them to one another. And the best part? Better than the fact that I’ve got kids asking me, “When will we be writing today?” ? The best part is these stories are darn good. Some of the them are shockingly good. I think I’m just as eager as the students to find out what will happen next. I can only imagine how fantastic their work will be after I’ve actually taught them about creating tension, characterization and establishing setting. They’re doing so much of this already, purely by instinct, and that is tremendously exciting to watch. Forgive the gushy teacher excitement, but I really needed a little magic 17 days before the end of a very long first term. 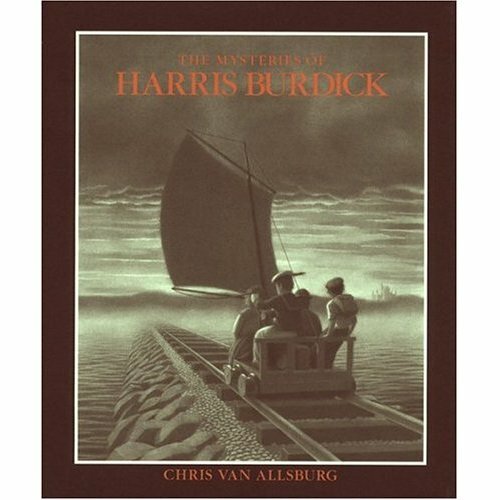 If you haven’t, check out The Mysteries of Harris Burdick Website for ideas on how to use the text in your classroom, and to read some examples of student-written stories inspired by the book (not to brag… but my kids’ stories could blow most of these out of the water). I bow to your greatness, Chris Van Allsburg. This entry was posted in Illustration, Just Cool, Middle Grade, Picture Books on November 26, 2008 by shelfelf. Holy fantastic, yes? I truly hope that it is creepy. I want it to be very creepy. 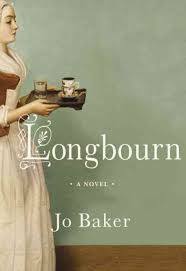 When I read the book for the first time, I could hardly sleep, what with the whole disembodied hand business. Delightfully terrifying. There are 2 cool websites to investigate. The first is the Coraline Film in Focus site. Lots of fun things there. Then we have the Official Coraline Website which is super eerie but also quite aggravating because you need these “keys” to enter the site and view the very awesome behind-the-scenes movie clips. Luckily, by the magic of the all-knowing Internet, I have deduced two of the keys all by myself… NOT! Try entering: “puppetlove” and “buttoneyes” and please do drop off any other keys you may discover in the comments section below, as a simple courtesy to moi. The fact that Neil Gaiman calls the movie “the strangest stop-motion film ever” has to be a good sign. (OK… just played some more with the Official Website and came across 2 more keys – you must try “armpithair” for a look at how Coraline got her groovy blue tresses, and then “sweaterxxs” to see the world’s tiniest sweater being knitted on toothpick-sized needles. Wow). This entry was posted in Just Cool on November 23, 2008 by shelfelf. Nick Hornby’s first venture into YA fiction is the story of a 15-year old skateboarding-crazy teen, whose life is just starting to look up when his girlfriend gets pregnant and everything comes crashing down faster than you can say frontside alley-oop. Slam follows an ordinary guy on a journey he never planned, into territory that’s intense, sometimes hilarious and as real as it gets. 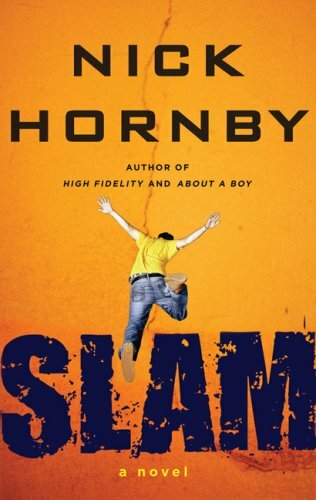 I’d been thinking about reading Slam for months, since I’m a huge fan of Hornby’s other work (High Fidelity, About a Boy, How to Be Good, A Long Way Down). I admire how he manages to create stories about everyday people that are compelling and thought-provoking. I’ve always thought his books should come with a warning somewhere on the back cover: Attention: Story inside is deeper than it appears. Hornby makes me appreciate the drama of ordinary life. This said, I admit I was a tad put off by the premise of his first YA novel. After all, there are plenty of books out there already that explore teen pregnancy. I had to wonder, couldn’t he come up with something a little more unexpected? I was worried that this book would veer into territory that’s been done and then some. 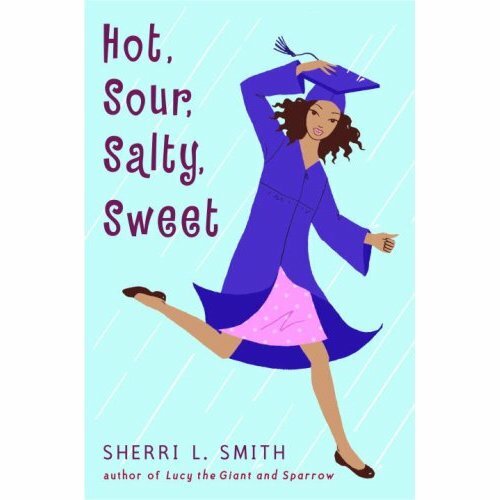 This entry was posted in Teen/YA on November 21, 2008 by shelfelf. And that’s just 5 of them people. Serious competition. 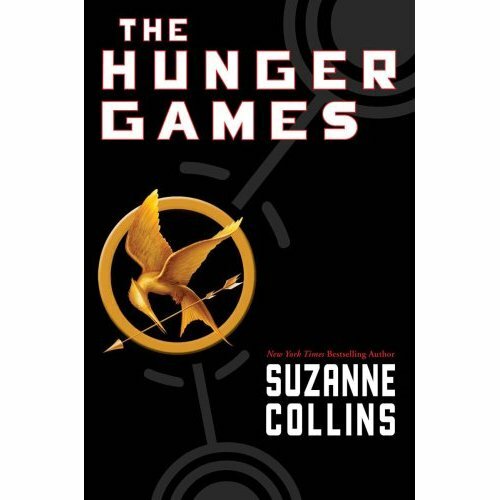 This entry was posted in Cybils, Just Cool, Middle Grade on November 18, 2008 by shelfelf.